This is original high quality product with 2-year warranty. We do not sell Chinese clones. Latest ToCOM version is ? Added overvoltage battery check before connection. 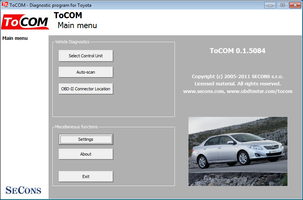 ToCOM is diagnostic software for Toyota, Lexus and Scion vehicles. Please use our contact form to get more information about ToCOM. Due to high demand on this product, ToCOM is currently provided in form of beta version, but it still comes with customer satisfaction guarantee. The beta version has some known problems that cannot be resolved without cooperation with customers. We're trying to be as transparent as possible: detailed ToCOM diagnostic coverage is available here, all currently known issues are described below. 14-days money-back guarantee if you will not be happy with the product. All customers are eligible for free updates. If you encounter any problem, please let us know. We'll try to resolve any issues as quickly as possible. The product comes with full user support. You'll get: ToCOM OBD2 USB interface, USB cable, CD-ROM with software and drivers, quickstart sheet. All this in plastic box. Everything is packed in bubble-mailer and all shipment are 100% insured. For more information see global product order page. We provide 2 years warranty for our products. Read why should you buy our products. Important notice: You are ordering beta version of ToCOM. Please read this page carefully to understand all limitations of beta version.